Paulo Silva “Professor Dakor” began studying Capoeira since 1993 with Master Tucas and Master Umoi from Grupo Uniao Na Capoeira in Lisbon, Portugal. He moved to London to attend university and undertook a degree in Sport Studies, B.A. 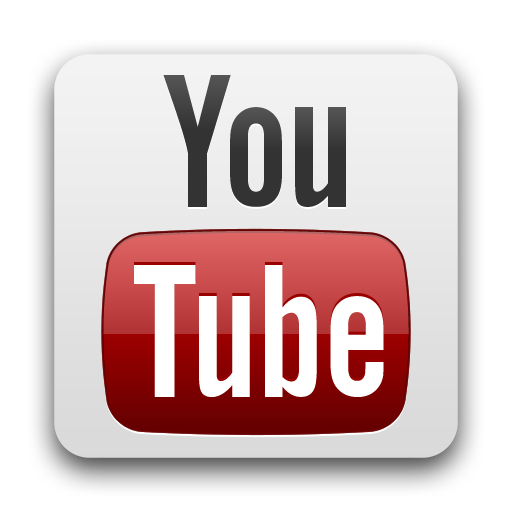 Hons and trained as a Fitness Instructor (YMCA personal trainer, Level 2). With his studies, he has been able to incorporate modern techniques to his Capoeira training. Dakor has had the opportunity of travelling to Brazil, Africa and Europe to further his Capoeira practice. From his contemporary knowledge and training in the ancient practises of Capoeira, Dakor has developed a philosophy for training. 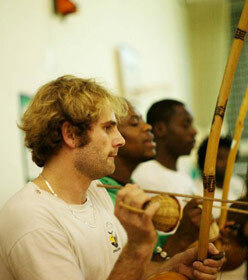 He believes Capoeira should no longer be taught according to the traditional individual notions of Capoeira Angola or Capoeira Regional and instead capoeiristas should be able to play to whichever rhythm the berimbau calls. His coordinator is Master Tucas from Grupo União Na Capoeira. Vincent Cullane “Instructor Carpinteiro”started Capoeira after seeing it being played on the beach, he joined his first class in 2001 with Professor Dakor and never looked back. He has played and trained Capoeira throughout Europe and traveled to Brazil to enrich his knowledge of Capoeira and Afro-Brazilian culture. 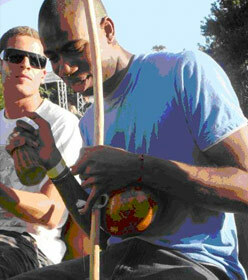 Carpinteiro began teaching Capoeira with União in 2008 under the supervision of Mestre Tucas and Professor Dakor. His energy, vitality and commitment supports and enriches the growth and continual development of the group, his energy and style helps make Capoeira União the unique group that it is. Peter Kelley “Instructor Dois Metros” began training Capoeira in 1999, under the instruction of Professor Dakor of Capoeira União. He is passionate about Capoeira and actively promotes the art form in the community through workshops and performances. He has traveled extensively throughout the Caribbean, Brazil and Nigeria, developing his interest in African artistic expression within the Diaspora. 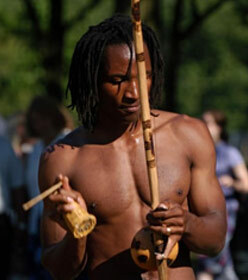 He believes Capoeira to be a celebration of life, and a unifying force. Dante ” Graduado Pedra” started Capoeira after a capoeirista helped him prepare for a title MMA fight. He subsequently won that fight and never forgot about Capoeira. He joined Capoeira União in 2002 and under the instruction of Professor Dakor and Instructor Dois Metros has managed to transcend from the world of MMA to capoeira without great difficulty. He embraces the fundamental martial aspects and philosophical values of Capoeira which have enriched his life and that of the people he has met. 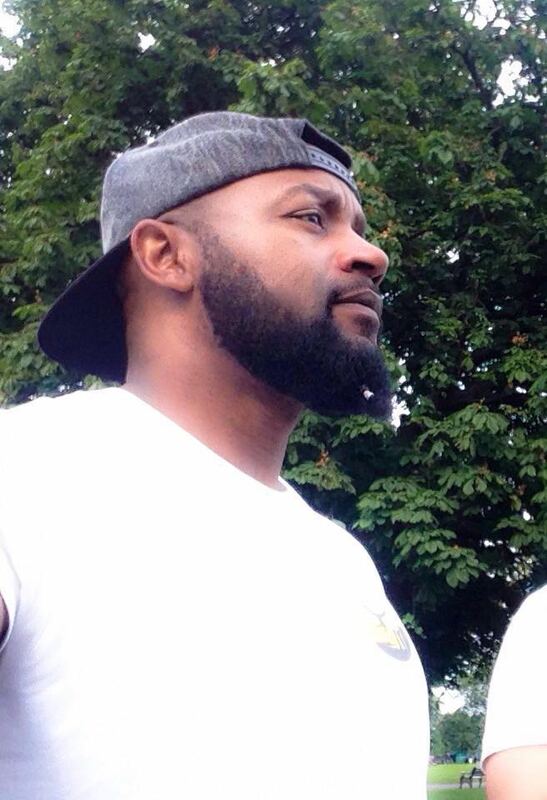 Dante has traveled extensively around the world including Brazil, Portugal and Africa in pursuit of Capoeira. His unique rigid style and infectious singing adds another bow to this diverse group.